FSU Art BFA ’13 Dustin Clark will be featured in a group exhibition, Rituals & Identity at the Ann Street Gallery in Newburgh, New York. Rituals & Identity brings together a diverse collection of works by twenty-two artists, who explore the theme of rituals through imagery and provide a fascinating glimpse into rites of passage, communal rites and the rites of personal devotion. Every society has rituals that mark daily routines and significant events during the life cycle: birth, marriage, and death. Most commonly defined as a series of established, habitual actions carried out for spiritual, social, political and personal significance; rituals are also the very processes by which identity is established and maintained. Based on ritualistic constructs, values are communicated, which assist in reaffirming individual and collective identities through a shared sensory, psychological and emotional experience. In turn, these identities influence how societies perceive and express themselves, adopt social customs and align themselves with certain religious or political beliefs. Through the works on display, this exhibit offers an opportunity to reevaluate the power of rituals in our modern day and take a fresh look at how they form our perceptions of who we are collectively and privately. In addition, we see the ability they have in impacting identity, societies and culture while uniting us in shared experiences. Artists featured: Kelly Boehmer, Laura Chenicek, Peter Christenson, Dustin Clark, Lisa Falkenstern, Margaret Fanning, Niamh Farrely, Nicole Foran, Alex Griffin, Grishma Khodaria, Virginia Lavado, Katrina Majkut, John C. Manion, Jaquelyn Mendez, Alfonse Pagano, Irene Pouliassi, Chris Revelle, Camilo Rojas, Ola Rondiak, Casey Whittier, Katie Wild, and Theresa Wilshusen. 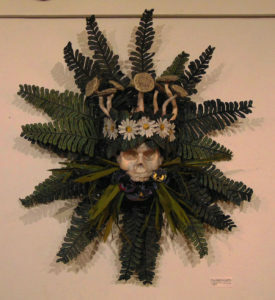 For more information regarding Rituals & Identity, or the Ann Street Gallery, contact Virginia Walsh, Director at (845) 784-1146 or visit www.annstreetgallery.org. The exhibition was curated by Virginia Walsh and will be on view through Saturday, August 4, 2018.